Ladies practice cuban heel shoes 2" heels or lower and dance sneakers. Receive your dance shoes WITHIN DAYS with FREE SHIPPING! Please check out our testimonials! Practice ballroom shoes and Cuban heel dance shoes have smaller heels and seem to be much more comfortable from our online ballroom dance shoes selection. Have both glamour and comfort with these Very Fine Dance Shoes for your practice ballroom shoes. A cuban heel is shorter for comfort. Select from various colors and sizes, each giving you the style and feel you want while you dance. There's no doubt, you'll have fun on the dance floor in these practice ballroom shoes from the online ballroom dance shoes store Saveondancewear.com. They are for those who want something more comfortable and easy to practice in choose from an extensive choice from the online ballroom dance shoes selection. Every dancer prefers to have a great pair of practice and cuban heel dance shoes so they can save their Latin or Standard Shoe for Showcases or Special Events. You’ll find it easier to balance in and easier to move with less pressure on the ball of your foot. The professionals and beginners both just love these practice ballroom shoes. And you’ll love the price as well! Another great option for practicing is wearing dance sneakers from the online ballroom dance shoes store! You will love the comfort, just like any practice ballroom shoes, but they are sneakers! Very Fine dance sneakers for those who spend all day on the dance floor needing a pair of practice ballroom shoes! Very flexible and comfortable. You will not want to take them off! Dance instructors that need to be on the dance floor all day and night love these dance sneakers. It's a great alternative from all ladies practice/Cuban heel shoes. Order your normal shoe size. These dance sneakers are unisex. 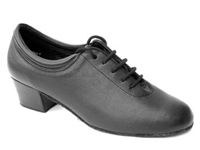 And don't forget: FREE SHIPPING on ALL PRACTICE BALLROOM SHOES, including dance sneakers.